AAWGT is a volunteer-run entity, guided by its Steering Committee consisting of Officers and Committee Leadership. Operating under the auspices of the Community Foundation of Anne Arundel County, Anne Arundel Women Giving Together was created by a group of 15 founding members, consisting of women philanthropists and community leaders and in 2017 celebrated 11 years of giving together. Each year, AAWGT conducts member education programs, a Grants Showcase featuring AAWGT grantees, site visits to grantees, volunteer activities, an annual retreat, membership outreach events (see Calendar of Events) and a Grants program that includes a rigorous grants review process and follow-up evaluation of all grantees. Through this grants process, AAWGT has distributed over $1,000,000 to 40 organizations in 11 years: approximately $40,000 in 2007, $57,000 in 2008, $60,000 in 2009, $65,000 in 2010, $79,000 in 2011, $103,000 in 2012, $95,000 in 2013, $94,000 in 2014, $105,000 in 2015, $100,000 in 2016, $111,000 in 2017, and over $105,000 in 2018. Just over 10% of AAWGT contributions support operations; the majority of AAWGT contributions go directly into the community to support local nonprofits. AAWGT encourages members to join one of our committees to participate more fully. Our committees welcome additional members: it is a great way to get involved, contribute your expertise, and build relationships with other members. Most committees meet once a month. 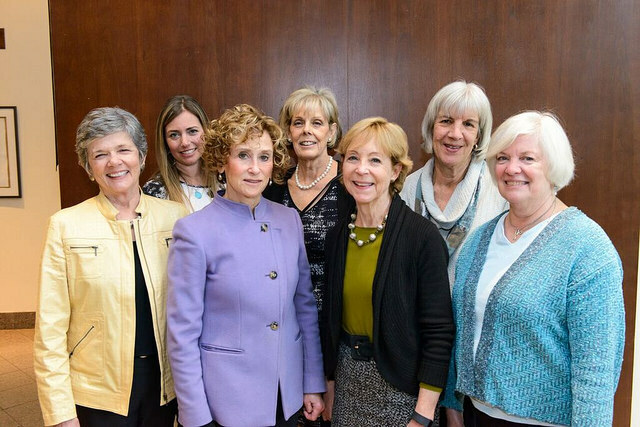 Front Row: Karen Smith (2015), Julie Schuelke (2012), Lynne Davidson (2010), Maureen Cavaiola (2014) Rear Row: Betsy Kimrey (Co-President 2006), Sharon Stewart (Founder), Bronwyn Belling (2011) Photo taken at 2016 Women & Leadership Forum on March 13, 2016. Slideshow (left): Members preparing lunches for Light House; handing off coats, backpacks etc. for Giving Back Linda's Legacy; meeting over dinner to select books for 2016 Book Group.